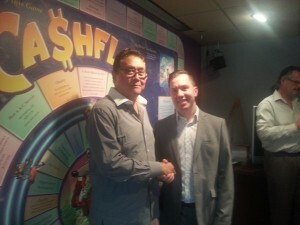 I had the honour of meeting one of my idols and someone who has completely changed my life with his teachings; Robert Kiyosaki. In case you don’t know, he is the author of “Rich Dad, Poor Dad” and has sold more financial education books than anyone else in the world! Robert is a great man with a great message: “To elevate the financial well-being of humanity”. His message is more important than ever before; with job security, pension plans and the middle class all disappearing you must ask yourself “Which side do I want to be on? The rich or the poor?” He is not the type of teacher that will tell you what to do each step of the way, but what he does is open your mind to success that is possible if you are willing to do what it takes. I had the chance to visit his office in Scottsdale, Arizona with Darren Weeks (one of the many benefits of being a Fast Track Coaching Student). Robert was very generous with his time and spent about 4 hours with us, speaking and teaching lessons that will stay with me forever. He told us stories about his battles in Vietnam as well as some of his battles in business and the lessons he has learned from them. The main take-away that I had was the phrase that he kept repeating “DEEDS, NOT WORDS”. He was pushing us to not just talk about what we want to do but to TAKE ACTION on the things that we’ve learned about business and investing in order to help our own lives and the lives of others. It’s great to increase your financial education and personal development but if those teaching are never put into action then it is just a waste of your time and money. On the other hand, if you learn and APPLY what you’ve learned then there is no limit to what you can achieve. The best return on investment you can achieve is on your own education, as long as you can apply those principles that you have learned. Too often I come across other “investors” who spend all of their time looking at houses, researching markets and getting everything ready to buy a property… But then they never do the most important part, the only thing that can make you money in real estate which is BUYING A PROPERTY! It seems simple but so many of us (including myself at times) get analysis paralysis; where we just research, analyze and prepare so much that we pick apart a good deal and never actually put in an offer. Sometimes it is years before I run into these same “investors” again and they STILL have not just gone ahead, used their knowledge about their market and just bought the investment property that will help out their financial future. I am in no way suggesting that you just dive right in and buy the first house that you see on MLS, but there comes a point where you just have to take the leap and just go for it! If you would like to get started in real estate investing and want to know the best way to start contact me and I would be happy to help provide you guidance and set you up with a great property. 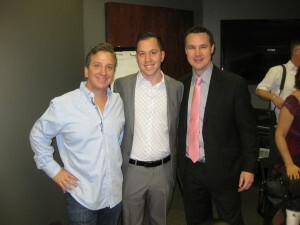 Mike Japuncic is a real estate entrepreneur and investor. He is the president and CEO of Azure Investing. His mission is to empower others and help them to invest in real estate to create a better future for themselves and their families.